The power supply (PSU) is one of the most important component for any crypto miner, even though it is often neglected as such by some miners, so it is no wonder that companies producing power supplies are starting to focus on the mining segment providing dedicated products. There are some companies such as Enermax, EVGA, Leadex that have very powerful power supplies that are not originally intended to be used for ASIC miners or GPU mining rigs, but often find their place as such. Fortron (FSP) however has announced their plans to release the first 2000 Watt power supply dedicated for miners and not for gamers or entusiasts – the FSP2000-A0AGPBI. 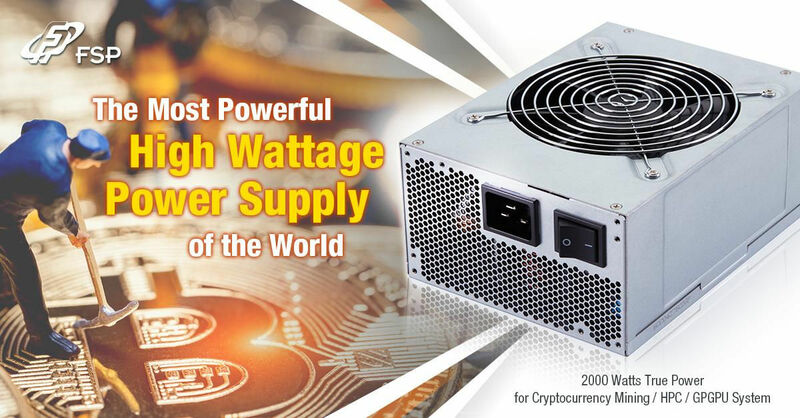 A good power supply for crypto mining needs has to offer high power output, good efficiency, reliability and most of all enough power connectors to suit every need that the miner will have for a certain application. FSP did that with the FSP2000-A0AGPBI by providing users with a good product offering 80 PLUS Platinum certification and 16x 6+2 PCI-E power connectors, so that should be enough for a lot of video cards or ASIC miners that fit into the power specs of the PSU. What might’ve been better is the peripheral connectors as they seem to be less than the ideal number you would want to have on a 2000 Watt power supply as you still need these for powering PCI-E extenders and it is never a good idea to connect more than two of these on a single line. The FSP2000-A0AGPBI power supply is not fancy in terms of looks or offer any fancy stuff like RGB lights or whatever as you often see on some high-end gaming oriented products, it focuses on performance and features, though there is more to be desired. One would expect to see a great price that makes interesting alternative to already available similar products, but unfortunately there are talks about 450 EUR price and you might be able to get 2000W Leadex with similar specs for less. So again, there is more to be desired from FSP as they haven’t apparently taken into account all of the requirements that crypto miners might have from such a product and price also being one of the important factors that needs consideration.